Collects X-Force (1991) #49-56, Cable (1993) #29-31, X-Man #14, &amp; X-Force/Cable Annual 1995.The shadow of Onslaught looms over Cable and X-Force! As a subtle evil begins its rise, the Askanison faces destinys call - which means a devastating confrontation with his counterpart from the Age of Apocalypse, Nate X-Man Grey! Meanwhile, X-Force is caught up in an unholy alliance between Sebastian Shaw and the horrifying Holocaust! As all hell breaks loose, the team will target their own leaders, Cable and Domino - and that means things get explosive! Threats lie in wait including the Blob, the Mimic, Selene, the Externals and S.H.I.E.L.D.! Boomer approaches Meltdown, theres Risque business for Warpath, and Siryn must enlist Deadpools help to regain her freedom! 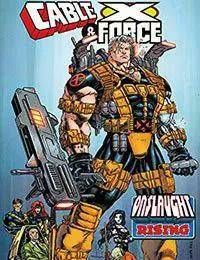 Plus, Cable and X-Force face impossible odds - as in, Impossible Man odds!